Hughes, J. (2016) 'Fractured Narratives: Writing the Biography of a Votive Offering', in I. Weinryb (ed) Ex Voto: Votive Giving Across Cultures, Chicago, University of Chicago Press: 23-48. For historians interested in the religious beliefs and practices of classical antiquity, votive offerings constitute a resource of almost immeasurable richness. Gifts to the gods—anathemata in Greek, dona in Latin—have been found at sites all over the ancient world, from the peak sanctuaries of Minoan Crete to the chilly streams of Roman Britain . Over the last few decades, scholars have become increasingly attentive to this form of material religion, and have adopted a wide range of approaches for studying it. Votives have been used, among other things, as documents for the study of social and gender history, as evidence for the development and transmission of religious beliefs, as sources for art historical analyses of ancient craft industries, and for the retrospective diagnosis of ancient illnesses. 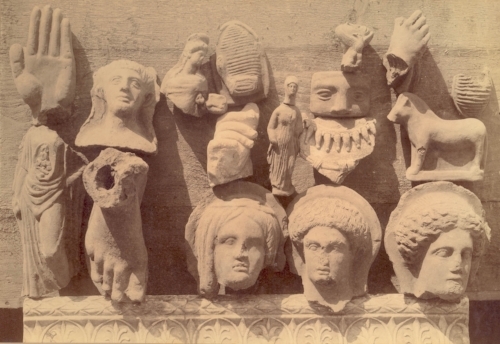 Although these studies differ widely in their aims and methods, they nevertheless share a common feature: they all consider the votives collectively, either in broader categories of form and/or medium (e.g., votive heads from terracotta, marble votive reliefs), or in the context of larger votive assemblages from particular sanctuaries or geographical areas. This chapter will adopt a different approach to the ancient votive offer- ing by tracing the “biography” of a single votive through time and across space. Object biographies and life cycles have become very popular in material culture studies recently and have been applied to a wide range of artifacts including Neolithic ceramics, Roman sarcophagi, and Japanese netsuke . The object biography is a promising mode of analysis for votives, given that these are often small and inherently mobile items, which inevitably—at least in the case of ancient Greco-Roman offerings—move over time from a sacred to a secular context. The biographical approach also encourages us to shift our attention away from the moment of ritual dedication (which has tended to dominate most scholarly analyses of votives) and onto later, equally interesting stages of the offering’s history. For the function and meaning of a votive are not fixed at the moment of dedication; rather, these properties change as the object moves through time and space and as it becomes entangled in new associations with things and people. The process of compiling a votive’s biography also has the potential to enhance that object’s value and meaning for modern audiences, not only because it allows us to attach engaging stories to the material offering, but also because it enables us to measure change in beliefs and attitudes in later historical periods, including our own. Fig. 1. Terracotta figurine from Nemi, fourth– second centuries BCE, front view. Photograph courtesy of Nottingham City Museums and Gal- leries. The ancient Roman offering that will serve as my case study in this chapter is a three-dimensional figurine made from terracotta, now in the stores of Nottingham Castle Museum (fig. 1) . This fragmentary object, which measures about 26.5 cm long, depicts a female body draped in robes. The head, left shoulder, and feet are missing. In her left hand, which is held straight down by her side, she carries a small circular object, which might itself be interpreted as a representation of a votive offering – possibly a piece of fruit. On her abdominal area is a schematic representation of the internal organs. A small rectangular piece of paper has been attached to the gure’s back, on which the following words have been written in pen: “Anatomical Votive Offering for some internal malady or childbirth from Artemision, Nemi, 1885” (Fig. 2). As well as suggesting an interpretation of the votive’s original meaning, this fading annotation points us toward its earliest known location—the sanctuary of Diana Nemorensis, which lies about twelve and a half miles (20 km) southeast of Rome and which was one of the most important cult sites in Roman Italy . Fig. 2. Terracotta figurine from Nemi, fourth–second centuries BCE, back view. Photograph courtesy of Nottingham City Museums and Galleries. Modern scholars place this figurine within a broader class of ancient “anatomical votives,” which comprises models of all different parts of the human body, including arms, legs, heads, hands, feet, torsos, and individual internal organs . Hundreds of thousands of anatomical votives survive from all over the ancient world, with the greatest number of examples coming from the area of central Italy corresponding to the modern regions of Tuscany, Lazio, and Campania. This particular type of “dissected” figure—which is often referred to as a “polyvisceral” model—is one of the less common types of anatomical votives, although a handful of other examples dating to the same period have been found at sanctuaries in the same area of central Italy . Such polyvisceral models represent both male and female bodies, which are either naked or clothed. Sometimes these bodies have heads and legs, but more often they are truncated torsos—an effective visual device for drawing attention to the middle portion of the body (Fig. 3). The figurine from Nemi is one of very few anatomical votives that has both a documented ancient ndspot and a traceable later history of collection and display. Not only do we possess information about its excavation and exportation from Italy in the late nineteenth century, we also have records of where and how it was displayed, stored, and used over the decades since then. This votive is better documented than many others largely because of its relatively unusual iconography (the open torso), which has led to its being singled out for comment and display during the later stages of its biography. This is a paradoxical aspect of the method of object biography: although one aim shared by many of its practitioners is to focus attention on the “insignificant” and previously overlooked, the historian’s dependence on documentation means that we are inevitably drawn to examples that have been significant and salient throughout their lifetime. That said, there are still many parts of this votive’s biography that have left no trace in the historical record, and these gaps will be evident in the pages that follow. The early stages of the votive’s life are particularly hard to reconstruct; thus, close visual analysis of the object needs to be supplemented with tentative references to our general knowledge about the votive industry in central Italy . In practice, this means that some early parts of this chapter present the “ideal” or “imagined” life of a votive of this type rather than the “truth” about this particular example, which might itself have been appropriated in unexpected and unpredictable ways. It should be clear, however, that my aim is not to write a comprehensive documentary history of a single votive but rather to show through a case study how the functions and meanings of a votive change as it moves through different contexts and becomes embedded in different relationships with gods mortals, and other objects. The figurine was made at some point between the fourth and second centuries BCE. As with most other anatomical votives from this area, we cannot be more precise about the date of her manufacture, partly because of the conditions of her excavation (which will be discussed later) and also because the widespread use of molds for this kind of votive problematizes any attempt to date them on stylistic grounds . We might assume that she was made either at Nemi, where she was found, or at a nearby city, such as Ardea, Segni, Rome, or Lavinium . The comparison of votive terracottas from these sites shows that they were frequently pressed from the same molds, which suggests that votives were either exported from a centralized place of production or produced by itinerant craftsmen who traveled around the various sites carrying their molds with them. The second alternative is perhaps the more likely because the finished votives would have been heavy and bulky to transport; indeed, many types of votive found at Nemi do not appear elsewhere in Italy, which might suggest that there was a local industry based at the sanctuary of Diana. The figurine is made from a reddish clay, rich with mica. It is hollow and open at the bottom; it also has a hole in the back, which ensured even ring and enabled the figurine to be suspended from a nail at a later stage of its biography. It was made in two pieces, front and back, each of which would have been pressed from a different mold (the molds would themselves have been pressed at an earlier time from a prototype figurine). The molds produced a standard “Tanagra” type figurine (a draped female body, named after the city in Greece in which many examples were found), and the representation of inner organs would have been added by hand before the firing process. We do not know whether the figurine ever had a head or whether, like other “truncated” types of polyvisceral models (such as the torso shown in figure 3), she was originally cropped at the neck. Presumably, it would have been easy enough for our craftsman to produce a headless body; many of the “normal” Tanagra-type figurines have separately molded heads that are fastened on with a tenon. The representation of internal organs on the figurine raises its own questions about production. Are we to think that the viscera were drawn from life, as was often the case with anatomical illustrations in later periods of history? The scientific dissection of human bodies was forbidden in classical antiquity, apart from a brief period in Hellenistic Alexandria . It is not impossible, however, that the Italic craftsmen had seen human organs in other contexts, such as surgery or accidents. Jean Macintosh Turfa has argued that some of the internal organ models must have been modeled on real human anatomy because they contain details that do not appear in most animal species. The clay uteri, for instance, are oval with a single “neck” and do not resemble the “bicornuate” (appearing as two distinct horns or tubes) uteri of animals such as cows, horses, pigs, and dogs . Turfa also notes that some uteri have anomalous features, such as rounded knobs, which she suggests may be schematic representations of fibroid tumors, a double cervix, or extra appendages, which perhaps represent congenital malformations. With the exception of fibroids, which might have been detected through nonsurgical examination, these anomalies must have been observed in postmortem dissection. The most likely context for seeing excised uteri would have been postmortem Caesarean sections, and Turfa draws attention to written evidence for this practice in antiquity—in particular the lex regia de mortuo inferendo (a law forbidding the burial of any woman who died when pregnant until the baby had been removed from her body), which was recorded in Justinian’s Corpis iuris civilis but attributed to the regal period of Rome’s history. Turfa’s work makes it clear that there were in fact occasions when the human interior might be viewed and suggests how this information might have been incorporated into polyvisceral offerings such as the figurine from Nemi. At the same time, we must not forget that artists would have had multiple opportunities to observe the dissection of animal bodies, particularly in the context of ritual sacrifice . Numerous artifacts from Etruscan sites depict the internal organs of the sacrificial animal, which are often being examined by a haruspex engaged in the act of “extispicy” (reading the will of the gods from the entrails of the sacrificial animal), as shown in Figure 4 . The conceptual overlap between the votive figurine and images of sacrifice and extispicy is a theme that will resurface later in this chapter, but for now it is enough to point out that the dissection of animal bodies may have furnished the votive craftsman with knowledge that he then incorporated into a human anatomical image. Some scholars who have examined this type of figurine have even identified specific animal organs within the opened human torso . This “transplanting” of animal organs into the human body might be seen as a material equivalent of the comparative anatomy practiced by the scientists of antiquity, who dissected pigs, goats, monkeys, and apes and transferred their observations to the human body. Fig. 4. Bronze mirror showing mythical haruspex Calchas, from Vulci, ca. 400 BCE. Vatican Museums. Drawing used with the kind permission of Nancy de Grummond. After the two halves of the figurine had been pressed together, it would have been put into the kiln for baking. At this point, the transformation of the clay from a damp and malleable substance to a dry and hard one may have had a symbolic signi cance, given that votives such as this one often seem to have embodied requests and thanks for some sort of change from the status quo. Paint may have been used to add color to the model after it had cooled. Traces of paint survive on a small number of other anatomical votives from central Italy: one polyvisceral plaque now in the British Museum, for instance, has organs of different colors, and a heart from the Etruscan site of Tarquinia has the major blood vessels highlighted with red paint . The resolutely orange figure that we see today may originally have been highly colored, and the colors may have reflected ideas about the internal composition of the human body that have now faded from history. If the polyvisceral figurine had been a personal commission, at this stage it may have passed directly to its new owner; otherwise, it may have been displayed among other votives in a stall or shop, awaiting a purchaser. Scholars usually assume that votive limbs and other moldmade body parts were bought “off the peg,” with customers choosing the most appropriate offering from a ready-made selection. There is some evidence, however, that offerings were tailor-made for individuals. For instance, we know of a handful of votive body parts that bear inscribed dedications; several others seem to incorporate individualized–perhaps in some instances pathological–bodily features. The comparative rarity and handmade elements of the Nemi votive might lend support to the idea that it was a personal commission; the identity of the buyer remains unknown, however, as does the reason he or she bought it. According to the usual logic of votive dedications, we might suppose that this figurine was bought by, or on behalf of, the person who was going to offer it and that this person, like the figurine, was female. As far as the buyer’s intentions are concerned, because the label on the figure’s back suggests either “some internal malady” or “childbirth,” these two plausible alternatives have been attached to this object. It is not necessarily the case, however, that anatomical votives were always used for healing or fertility, and the figurine may well have been used to express something quite different . In addition to the specific meaning that it held for the dedicant, the figurine also fits into broader narratives about Diana and her sanctuary at Nemi. Diana was a Roman goddess who was intimately concerned with the lives of women, particularly with the transitional states of childbirth, healing, and death. She was frequently identified with the Greek goddess Artemis, who was also associated with fertility and childbirth, and with the Italian birth goddess, Lucina (the name is derived from the Latin lux, lucis), whose job it was to deliver children “to the light.” Besides our figurine, other archaeological finds from Nemi also appear to be associated with childbearing and healing. These include clay models of uteri and seated couples with infants, as well as other body parts, including heads, limbs, and male genitalia. A number of medical instruments made from metal have also been discovered, which were probably votive dedications rather than tools for on-site surgery . These various offerings may have been dedicated to Diana or to the local Italian deity Virbius, who was also worshipped in the sanctuary and who had his own link to divine healing. His story, as recounted by Ovid and Virgil, begins with the death of the Greek hero Hippolytus, who was brought back to life by Asklepios, the god of healing, and then taken to the grove at Nemi by Artemis/Diana, who changed Hippolytus’s name to Virbius . This tale of bodily resurrection—the ultimate healing miracle—would surely have resonated with anyone who visited the sanctuary hoping for their own restoration to health and well-being. Another set of narratives about Nemi might be particularly relevant to our figurine because they deal with the theme of human sacrifice. The “incision” in the body of the clay woman would have recalled the cut that was routinely made in the body of the sacrificial beast, producing a startling image of human (self-)sacrifice that underscores the dedicant’s desire to place herself in the care of the deity . The sacrificial resonances of our female figurine would have been palpable in any ancient sanctuary, but they arguably had particular significance at Nemi because human sacrifice featured in the story of this sanctuary’s origins as well as in its ongoing ritual life. In Nemi’s foundation narrative, the sanctuary was an offshoot of the cult of Tauric Artemis, who, in the words of James Frazer, “could only be appeased with human blood” . Authors of the Roman period connected the barbarous Scythian origins of the cult with Nemi’s violent ritual of priestly succession–the ritual of the rex nemorensis. This ritual involved a runaway slave challenging Diana’s priest to a fight by hitting him with a branch from the sacred grove–if the slave killed the priest, he would become priest himself and stay in office until killed by his successor . The votive figurine may have been seen as a particularly appropriate offering for a temple in which human sacrifice played such an important role; in turn, this offering served as a visual mnemonic, reminding visitors of the sanctuary’s foundational narrative. After the votive had been purchased, it would have been prepared for dedication (dedicatio, or consecratio). This would have involved, among other things, a journey through the sanctuary to the place where the votive was to be left. Such intermediary stages leave no trace in the archaeological record and are therefore often sidelined in academic discussions, but they would nevertheless play an important role in shaping the votive’s meaning. For instance, the time that the new owner spent holding and looking at the votive before relinquishing it to a god would have helped to construct the all-important relationship between object and giver; meanwhile, any hardship or difficulty experienced during the “pilgrimage” to the spot of dedication would have enhanced the value of the offering and intensified its meaning. We have no evidence for special rituals of dedication other than the placement of votives on a chosen spot. But at the moment it was handed over, the votive became the property of the deity, marking either the opening or closure of a transaction. In the first instance, the dedicant was asking for a divine favor (as suggested by the Latin formula do ut des: “I give so that you may give”); in the second, they were repaying a favor that had already been awarded (as suggested by the common inscription votum solvit libens merito: “The vow ful lled, I pay my debt freely”). Fig. 5. Plan of the sanctuary of Diana at Nemi. Photograph from G. H. Wallis, Illustrated Catalogue of Classical Antiquities from the Site of the Temple of Diana, Nemi, Italy (Nottingham, 1893). Where in the Nemi sanctuary might the votive have been left? Very few excavated ancient sanctuaries have votives at the site of their dedication, but the exceptions suggest possible locations for the deposition of our votive at Nemi. At the sanctuary of the Thirteen Altars at Lavinium, for example, votives body parts were found strewn over the surfaces of the altars and on the platform areas between them . At Nemi, the main altar stood in front of the northeastern corner of the temple, at the point marked “N” on the sanctuary plan shown in Figure 5. Had our votive been dedicated on or near this altar, the sacrificial overtones of the image would be brought to the fore. Another possible location for the dedication of our figurine is suggested by comparison with the temple complex of Gravisca near Tarquinia. At Gravisca, terracotta votives were found clustered around a series of marble bases, which probably supported cult statues of the divinities who were worshipped there . The sanctuary of Nemi contained more than one representation of Diana, including the famous triple image represented on Republican coins, and it may be that the figurine was offered directly to the material embodiment of the goddess, as are offerings to a modern-day saint or Madonna . The figurine would have remained in the sanctuary when the dedicant left, its physical presence functioning as a monumentum of a transient, on-site interaction with the divinity. Of course, because the figurine was not inscribed, other visitors to the sanctuary would have been left to guess the identity of the dedicant and the nature of the vow it commemorated . In this case, we might see the hermetic anonymity of the votive offering as performing an important function insofar as it was a token of a private dialogue between dedicant and deity from which all other mortal onlookers were excluded. As time passed and the physical space of the sanctuary became more crowded, the offerings in the sanctuary may well have been moved around by the temple priests or caretakers. Other dedicants may have rearranged the display, moving the figurine farther back so that their own offerings were more prominent. Our votive figurine would now have played a role in legitimating these new offerings by symbolizing the long ritual tradition of which they formed part . During this period of display in the sanctuary, the meaning of the votive offering would be shaped by the assemblage of objects that were placed around it. For instance, if the figurine had been displayed alongside the other body parts found at the site – which included heads, ears, nose, tongues, breasts, arms, hands, legs, and feet–viewers may have interpreted it by default as another request for healing, in this case for the intestinal area. Had it been seen next to one or more of the “normal” Tanagra-type figurines from the site (those without intestines), these would have set up a normative model from which our figurine deviated, offering a striking visual contrast between open and closed, revelation and secrecy . Had it instead been viewed alongside the set of medical tools mentioned earlier, the figurine could have appeared as the object of an operation performed by an invisible “surgeon” goddess. Although we cannot know exactly which objects and images would have been juxtaposed with the figurine, the range of possibilities outlined here intimates how far the alternative settings for the votive figurine had the potential to nuance its meaning. One other object that might have been viewed alongside the polyvisceral figurine is a now lost marble relief that was found in 1791 not far from the ruins of the temple. In his notes on the 1885 excavations at Nemi, the archaeologist R.P. Pullan identified the scene as a representation of the rex nemorensis ritual, in which the vanquished priest lies on the ground “with his entrails protruding from a wound in his side; over him stands the victor with the fatal sword in his grasp, surrounded by four females in Etruscan robes who seem to be rejoicing at his success and giving thanks to the god for it” . This marble relief is important because it reminds us again that the area of Nemi was redolent with the stories and imagery of human sacrifce and that visitors to the sanctuary—unlike the modern viewer—would have been primed to notice the sacrificial symbolism of our polyvisceral figurine. It may also be significant that the lost marble relief displays human entrails in the context of a rite of passage (the changeover of Diana’s priests); the votive figurine may also have been dedicated to ensure some kind of transition, such as the passage from sickness to healing or the successful delivery of a child. As time passed, the figurine may have become shabby, discolored, or broken. Such material disintegration would have underlined its new function as a general symbol of the sanctuary’s past and as a visual re- minder of Diana’s power and longevity. But eventually it was taken off display, perhaps to make space for new dedications. As at other sites in Greece and Italy, the sanctuary was periodically cleared of many of its older offerings, which were stored or buried in favisae (pits or under- ground chambers) . The polyvisceral figurine was placed in a pit more than twenty feet deep at the southern corner of the temple platform (Fig. 5, D) along with more than three hundred other clay offerings . The relatively good state of preservation of these objects suggests that they were placed gently in the pit rather than in carelessly—a sign, perhaps, of continued reverential treatment of the goddess’s property. After this, the pit was filled in with earth, creating a damp, dark, and silent environment in which our figurine was to spend the next twenty centuries. According to Pullan, these artifacts “were evidence of the existence of a temple in the vicinity, for when the temples became crowded with votive offerings, such as these terra-cotta figures, it was the custom for the priests to bury them. . . . Between three and four hundred of these ex-votos are dug up” . Fig. 6. Selection of objects from the excavations at Nemi. Courtesy of Nottingham City Museums and Galleries. An illustration of a selection of these objects allows us to see our polyvisceral figurine at the left of the image, situated nonchalantly underneath a disembodied hand (Fig. 6). Pullan’s mention of “two or three anatomical figures” is intriguing, insofar as it suggests that our figurine was not a unique specimen among the Nemi finds. Recently, Ann Inscker, collections access officer for archaeology and industry at Nottingham City Museums and Galleries, has identified another figurine produced from the same mold as our figurine; however, because only the knee, drapery, and hand (holding the same round object) remain, it is impossible to tell whether this figurine also had intestines in her abdominal area . Apart from this possibility, several polyvisceral models in modern museums are without any provenance, and one or more of these models may have been excavated at Nemi. Our figurine was one of the first objects to be discovered in Savile’s excavation; presumably, she was kept in storage for the rest of the spring and summer. Because the handwriting has been identified as Savile’s own, it is possible that the paper label was glued to the figure’s back during this time. At this point, the Nemi phase of her life was nearly over. Savile disapproved of Prince Orsini’s mercenary attitude to the discovered objects and decided to withdraw from the excavations after eight months. What happened next shows how a single votive’s trajectory can be influenced by contemporary ideas about beauty and value. The finds that had been excavated up to that point were divided between the two men, with Orsini claiming the “better half”—the marble statues, herms (stone posts topped by a head or bust), and portrait busts from the imperial period, together with all the imperial coins—while Savile was left with the Republican material, including terracottas, small bronzes, coins, inscriptions, and miscellaneous finds. It is perhaps unsurprising that the clay models of body parts were allocated to Savile, for although these objects were already arousing the interest of the medical community, contemporary art historians found them lacking in merit . So while Nemi’s more illustrious marble imperial-age sculptures soon made their way onto the international antiquities market, making a tidy profit for Orsini, our small figurine was packed into one of twenty-three wooden crates with Savile’s other pieces and sent by ship to England. “The question whether this can be considered as a true anatomical representation, indicating a pathological condition, the cure of which was the object of the offering, has been decided in the negative by competent authorities, the representation of the viscera being arbitrary and conventional, produced by a modeler who has no exact notion of human anatomy” . Savile’s interest in the accuracy of the intestinal representation was typical of the period in which he was writing. Until the second half of the twentieth century, much of the published work on anatomical votives appeared in medical journals, penned by “competent authorities”—that is, medical historians or physicians with an interest in the history of their profession. These writers paid most attention to those models of body parts showing signs of pathological conditions and to the polyvisceral representations that closely corresponded to the current anatomical teaching models. In the medical journals, as in Savile’s commentary, the emphasis was on the (in)accuracy of the representation; articles were frequently illustrated with line-drawing reproductions of the votives with various individual organs labeled, ending with broad statements about anatomical knowledge in antiquity and subsequent medical progress . Significantly, such statements inverted the original relationship between organs and knowledge that operated in the Roman sanctuary, where the internal organs were seen as active imparters of knowledge—through the rituals of extispicy, the will of the gods was to be discovered. Instead, the late-nineteenth-century commentaries on these votives present the internal body as a passive entity to be known, mapped, and labeled. On one level, then, Savile’s description of the figurine reflects contemporary medical interest in the accuracy of ancient anatomical representations and was written within the framework of a teleological narrative of biomedical progress. Beyond that, his interpretation is rather opaque. It is not clear whether he means that the “arbitrary and conventional” representation of the votive necessarily excludes a healing interpretation, and, if so, why he changed his mind after writing the figurine’s label. More recent discussions of votive offerings emphasize the functional importance of mimesis and accuracy. David Freedberg, for instance, notes that “the operational effectiveness” of votive body parts “is perceived as deriving from the closest possible form of realism available to maker and consumer” . But the moldmade production of ancient Italic terracottas suggests that during that period the votive did not necessarily have to resemble the dedicant’s own body to be effective. Perhaps this was Savile’s point, but the awkward syntax of his description makes it difficult to decipher. The layout of this first museum exhibition would have guided visitors toward interpreting the figurine as a votive for childbearing rather than healing. The catalogue records that it was displayed in case 2 alongside two statuettes of “mothers seated each with a child on her lap”; like the votive uteri displayed nearby, these statuettes were taken by Wallis and Savile “to indicate the worship of Diana Lucina” (Diana as guardian of women in child- birth) . Again, we see how the display context of the votive influenced its meaning. Whereas in antiquity the juxtaposition with opened animal bodies foregrounded the sacrificial element of the votive, in the exhibit the juxtaposition with nursing mothers constructed the representation as a specifically female interior. Lord Savile’s collection was displayed from 1890. I suspect . . . that most of the collection remained in Gallery L until 1933 when all but a selection were stored in packing cases. The individual items were wrapped in newspapers of that date. More may have been stored during the 1939–45 war but I have no info on that point. When I came in 1964 some Nemi material was on display, and it was redisplayed in 1968–70 but it was only after 1974 that it became possible for me to unpack all the boxed objects. In 1983 the special exhibition was opened, displaying some of the finds stored since 1933 as well as objects which may have continuously been displayed since 1890, with the possible exception of wartime . MacCormick’s letter gives the impression of continuous interaction with the Nemi finds over the first half of the twentieth century, during which time they were handled by various museum staff, wrapped in newspaper, put in cases, taken out again, and moved around different spaces in the museum. The precise whereabouts of our polyvisceral figurine during this period are difficult to reconstruct, although we know that she was displayed in the “special exhibition” of 1983, a temporary show called “Mysteries of Diana” that took place while the museum was being restructured. According to reviews, this exhibition took rather a traditional approach, “placing reliance upon a straightforward exposition of the finds themselves, helped by main and subsidiary labels, and by photographs, and without the use of any audio-visual equipment or elaborate reconstructions, apart from a model of the temple as it was in its heyday” . The finds were divided into cases according to artifact type, with marble sculptures displayed together, then marble architectural inscriptions, coins, and architectural terracotta sculptures. Our figurine was placed in one of the back corners of the square room along with the other votive terracottas in a wood-framed glass case against a background of dark red felt. In one sense, the “Mysteries” exhibition conserved the ancient context of the figurine by displaying it alongside objects that might plausibly have been grouped together in the Nemi sanctuary. But in other ways it drastically changed the relationship between the votive and the viewer by placing the figurine behind glass and transforming it into an object of detached contemplation. The arrangement of the exhibition also put the figurine into new relationships that reconfigured its meaning for spectators. For example, the Nemi finds were arranged peripherally around a display about Lord Savile (invoked in the form of a portrait bust), cementing the relationship between the objects and the aristocrat who found them. Sam Alberti has pointed out that “the most famous (or wealthy) individual may . . . remain indelibly connected with a collection. As with whole museums, so particular objects retain a relationship with persons involved in their trajectory, principally those of the highest status”. These words ring true in the case of our votive figurine, for although the object biography sketched in this chapter suggests how different people (maker, dedicant, other visitors to the sanctuary, priests, and modern curators and viewers) interacted with this votive over the centuries, Lord Savile looms larger than any of these other participants in its retrospective life story. The polyvisceral votive figurine from Nemi is still in the collection of the Nottingham Museum, although it is no longer on display. The disability legislation of the 1990s led to the closure of the Savile gallery, and its contents were transferred into the museum storerooms on the nearby Castle Road. The figurine is now comfortably ensconced within a purpose-made polystyrene mold, inside a plastic box labeled with the museum inventory number and a brief description (“woman with schematic intestines”). Her life, however, is far from quiet. She has regularly been seen and handled by students and academics, while digital technology has enabled the dissemination of her image to a global public. To give one example, the figurine appears in an innovative “online sanctuary” created in a collaboration between Nottingham Museum and Nottingham University, which offers visitors the chance to “reinterpret the votive worship of ancient Rome” by dedicating a virtual votive to friends, family, or loved ones. This site reclassifies the Nemi material yet again, this time using categories that anticipate the social needs of the website’s visitors. Eighty objects from Nemi are divided into five headings that reflect the organization of a contemporary greeting card shop: “Good Luck,” “Condolences,” “Well Being,” “Congratulations,” and “Celebration.” Visitors are instructed to choose a votive and dedicate it in the virtual temple for someone they wish well; that person can then be notified by email to come onto the site and view the votive along with a personal message from the well-wisher. The Speculum Dianae website might be seen by some as the ultimate form of secularization; votive objects such as our figurine are reproduced with the click of a computer mouse, while the goddess Diana herself is replaced by an interchangeable mortal recipient. Paradoxically, though, this latest stage in the figurine’s biography brings us closer than any other to the votive offering and its original dedicant. This is not (only) because the website text openly encourages us to step into the dedicant’s shoes and to repeat, in a virtual environment, the actions that they would have performed in the Nemi sanctuary. The identification is more profound than this, because the process of selecting a single offering brings these ancient objects into a dialogue with our own individual life experience. The polyvisceral figurine appears with other body parts in the category “Well Being,” with a brief description that incorporates the text of Savile’s nineteenth-century label (Fig. 7). Fig. 7. Screenshot from the “Speculum Dianae” website, accessed July 6, 2015. Reproduced with the kind permission of Katharina Lorenz. What would happen if our votive were sent as a dedication for a twenty-first-century sufferer from “some internal malady”? Anthropologist Tim Ingold has argued that “the more that objects are removed from the contexts of life-activity in which they are produced and used – the more they appear as static objects of disinterested contemplation”. In this case, however, we might imagine that an ailing recipient of this “healing” votive would regard the open, fragmented body with empathy or with a sense of recognition or perhaps anxiety; in this way, they would surely experience a close, even visceral, engagement with the object and its ancient user. This chapter has taken its inspiration from recent scholarly work on object biographies and life cycles and has explored what these methods might bring to our understanding of votive offerings. It has tracked the career of a single Etrusco-Italic votive through time and across space, observing (or sometimes imagining) how this object’s function, meaning, and value changed at key moments between its production in clay in the Roman Republican period and its reproduction in high-resolution photography in the twenty-first century. This fragmented clay body has opened a window onto aspects of the worlds through which it has passed: for instance, we have glimpsed how the votive might relate to ancient perceptions of the relationship between human and animal bodies as well as to the overlap in Greco-Roman thought between concepts of healing and sacrifice. The modern trajectory of the votive has provided insights into changing ideas about the aesthetic, economic, and historical value of votives, as well as drawing attention to the different ways in which later cultures have responded to the religious material culture of the past. One more general issue that has been highlighted concerns the close interrelationship between votive objects and their wider context. As we have seen, the meaning of a votive is partly dependent on its changing physical location as well as on the broader social and cultural background against which it is contemplated. I have argued, for example, that the geographical location of this votive within the sanctuary at Nemi allowed it to function as a visual mnemonic of the sanctuary’s violent foundation narratives; meanwhile, the temporary positioning of the votive on the sanctuary’s altar would have brought the sacrificial aspect of this image to the forefront. The shifting assemblage of other objects placed in the vicinity of the votive would also have enabled different interpretations. As we have seen, the pairing of the figurine with a sculpted scene of violent death suggests a very different reading from its pairing with a votive terra-cotta model of a uterus. The viewers of the votive would also have participated in the creation of its meaning, bringing their own unique set of memories and beliefs to the encounter with the object and its setting. This three-way relationship among votive, environment, and viewer results in a rich multivalency that resists our attempts to tie these objects down to a single, “original” meaning or function. The questions of why and by whom a particular votive was offered become the starting point rather than the final goal of analysis; meanwhile, the confident labels attached to these objects (“votive offering for some internal malady or childbirth”) become evidence of a step in an ongoing story rather than that story’s entire content. Finally, however, this chapter has also demonstrated how difficult it is to reconstruct the story of any votive offering in its entirety. Our exemplar votive from Nemi has periodically disappeared from the historical record, forcing us to recognize the gaps in our knowledge and to think creatively about the unattested stages of the votive’s journey. Even in the later periods, for which we have more “hard” evidence about the votive’s whereabouts, a small number of privileged voices are heard at the expense of the many others who must have come into contact with the object and constructed their own possibly discrepant interpretations. In this sense, the task of reconstructing a votive’s biography may become easier in future years as more votives are uploaded onto the internet and re-presented in creative digital resources, so that they accrue ever-longer “data shadows” that can then be retrieved and analyzed by subsequent users. These yet-to- be-written votive biographies may help us comprehend the exact nature of our distance from the ancient sanctuary while also making us think critically about how we should preserve and present these votives in the latest (but not the last) stage of their fractured narratives. I would like to thank Janet Huskinson, Susie West, and Ann Inscker for reading and commenting on earlier versions of this chapter. I am also grateful to Katharina Lorenz and Nancy de Grummond for help with sourcing images. 1. For votive offerings in antiquity, see W. H. D. Rouse, Greek Votive Offerings: An Essay in the History of Greek Religion (Cambridge: Cambridge University Press, 1902); F.T. Van Straten, “Gifts for the Gods,” in Faith, Hope, and Worship: Aspects of Religious Mentality in the Ancient World, ed. H.S. Versnel (Leiden: Brill, 1981), 65–151; G. Bartoloni, G. Colonna, and C. Grottanelli, eds., Anathema: Regime delle offerte e vita dei santuari nel mediterraneo antico (Rome: Università degli studi di Roma “La Sapienza,” 1989–1990); “The Object of Dedication,” ed. R. Osborne, special issue, World Archaeology 36, no. 1 (2004); and the section on “Dedications” in the 2004 Thesaurus cultus et rituum anti- quorum (Los Angeles: J. Paul Getty Museum (2004), 1:269–450, with further references; hereafter cited as ThesCRA. For the terminology of Greek votive offerings, see M. L. Lazzarini “Le formule delle dediche votive nella Grecia arcaica,” Monumenti antichi 19 (1976): 45–354; R. Parker “Introduction, Lit- erary and Epigraphical Sources,” in ThesCRA 1:269–281. Note that the Latin word donarium indicates the material ful llment of an earlier vow (votum). 2. For other applications of the object biography method, see R. Grimes, “The Life-History of a Mask,” Drama Review 36, no. 3 (1992): 61–77 (on ritual and biographical masks); A. E. Cooley, ed. The Afterlife of Inscriptions: Reusing, Rediscovering, Reinventing and Revitalizing Ancient Inscriptions (London: Bul- letin of the Institute of Classical Studies, 2000) (on Roman inscriptions); C. Holtorf, “Notes on the Life History of a Pot Sherd,” Journal of Material Culture 7 (2002), 49–71; A. Jones, Archaeological Theory and Scienti c Practice (Cambridge: Cambridge University Press, 2002), chap. 5 (on Neolithic ceramics); E. de Waal, The Hare with Amber Eyes: A Hidden Inheritance (New York: Farrar, Straus and Giroux, 2010) (on Japanese netsuke); J. Huskinson, “Habent sua fata: Writing Life Histories of Roman Sarcophagi,” in Life, Death and Representation: Some New Work on Roman Sarcophagi, ed. J. Elsner and J. Huskinson (Berlin: De Gruyter, 2010), 55–82. 3. Mus. inv. no. N131. See T. F. C. Blagg, Mysteries of Diana: The Antiquities from Nemi in Nottingham Museums (Nottingham: Nottingham Castle Museum, 1983), 53; M. Moltesen, ed., I Dianas hellige lund: Fund fra en helligdom i Nemi (Copenhagen: Ny Carlsberg Glyptotek, 1997), 205. 4. For the sanctuary of Nemi, see T.F. C. Blagg, “Cult Practice and Its Social Context in the Religious Sanctuaries of Latium and Southern Etruria: The Sanctuary of Diana at Nemi,” in C. Malone and S. Stoddart, eds., Papers in Italian Archaeology 246, no. 4 (1985): 33–50, and “The Cult and Sanctuary of Diana Nemorensis,” in Pagan Gods and Shrines of the Roman Empire, ed. M. Henig and A. King (Oxford: Oxford University Press, 1986), 211–219; J.R. Brandt, A-M. L. Touati, and J. Zahle, eds., Nemi—Status Quo: Recent Research at Nemi and the Sanctuary of Diana (Rome: “L’Erma” di Bretschneider, 1997); Moltesen, I Dianas hellige lund; C. M. C. Green, Roman Religion and the Cult of Diana at Aricia (Cambridge: Cambridge University Press, 2007). The site was in use from at least the sixth century BCE, when it may simply have consisted of an altar and cult statue, until the imperial period, by which time it had a large temple set within a monumental precinct on an arti cial terrace above the lake. 5. On votive body parts in antiquity, see Van Straten, “Gifts for the Gods”; B. Forsén, Griechische Gliederweihungen: Eine Untersuchung zu ihrer Typologie und ihrer religions- und sozialgeschichtlichen Bedeutung (Helsinki: Finnish School at Athens, 1996); “Models of Body Parts,” in ThesCRA 1:311–312 (with bibliogra- phy); G. Baggieri, ed., L’antica anatomia nell’arte dei donaria (Rome: Ministero per i beni e le attività culturali, 1999); J.M. Turfa, “Anatomical votives,” in ThesCRA 1:359–368 (with bibliography); A. Petsalis-Diomidis, “The Body in Space: Visual Dynamics in Graeco-Roman Healing Pilgrimage,” in Pilgrim- age in the Greco-Roman World: Seeing the Gods, ed. J. Elsner and I. Rutherford (Oxford: Oxford University Press, 2005), 183–218; C. E. Schultz, Women’s Reli- gious Activity in the Roman Republic (Chapel Hill: University of North Carolina Press, 2006) 95–120; J. Hughes, “Fragmentation as Metaphor in the Ancient Healing Sanctuary,” Social History of Medicine 21, no. 2 (2008): 217–236. 6. On polyvisceral models and other internal organ votives, see P. Rouquette, “Les ex-voto medicaux d’organes internes dans l’antiquité Romaine,” Bul- letin de la Société Française d’Histoire de la Médecine 10 (1911): 504–519; F. Reg- nault, “Les ex-voto polysplanchniques de l’antiquité,” Bulletin de la Société Française d’Histoire de la Médecine 20, nos. 3–4 (1926): 135–150; M. Tabanelli, “Conoscenze anatomiche ed ex voto poliviscerali etruschi e romani di Tes- sennano presso Vulci,” Rivista di Storia della Medicina 2 (1960): 295–313, and Gli ex-voto poliviscerali etruschi e romani (Florence: Leo S. Olschki, 1962); P. Decou é, La notion d’ex-voto anatomique chez les Etrusco-Romains: Analyse et synthèse (Brussels: Latomus, 1964); J.M. Turfa, “Anatomical Votives and the Italian Medical Tradition,” in Murlo and the Etruscans, ed. R.D. De Puma and J.P. Small (Madison: University of Wisconsin Press, 1994), 224–240; M. Recke, “Science as Art: Etruscan Anatomical Votives,” in The Etruscan World, ed. J.M. Turfa (London: Thames and Hudson, 2013), 1068–1085. 7. Holtorf warns that “no life before the moment of discovery can be assumed: any assertions about the origins and, if you will, earlier ‘lives’ of a thing are the outcome of various processes in its present life.” Holtorf, “Notes on a Life History of a Pot Sherd,” 8. One might also argue that the later stages of an object’s life are the outcome of earlier ones (the interesting design of the offering fuels the desire of collectors; its mode of disposal facilitates its easy excavation by archaeologists, and so on). 8. The style of anatomical votives from central Italy is very conservative. Most examples were made in molds, which means that any date we can surmise is the date of the mold, not the object that was pressed from it. Figurines such as the Nemi votive (without the intestines) also sometimes served as prototypes for new molds. 9. Blagg suggests Rome as the location; Blagg, Cult Practice and Its Social Con- text, 39. 10. See H. von Staden, “The Discovery of the Body: Human Dissection and Its Cultural Contexts in Ancient Greece,” Yale Journal of Biology and Medicine 65, no. 3 (1992): 223–241. 11. Turfa, “Anatomical Votives and the Italian Medical Tradition,” 224–240. 12. The literary, epigraphic, and iconographic sources for ancient (Greek, Etruscan, and Roman) sacri ce are collected in the rst volume of ThesCRA, sec. 2a, along with a modern bibliography on the topic. 14. See, for example, M. Tabanelli, Gli ex-voto poliviscerali etruschi e romani (Florence: Olschki, 1962), 47. 15. J.M. Turfa, “Anatomical Votive Terracottas from Etruscan and Italic Sanctuaries,” in J. Swaddling, ed., Italian Iron Age Artefacts in the British Museum, 208 n. 1, gs. 1a–b (London: British Museum, 1986); G. Baggieri, L’antica anatomia nell’arte dei donaria, 98, 720. 16. The general consensus is that anatomical votives represent a part of the body that suffers or that has been healed, although recent discussions acknowledge that votives probably had a much wider range of meanings. See, for example, F. Glinister, “Reconsidering ‘Religious Romanization,’” in Religion in Republican Italy, ed. C. E. Schultz and P. B. Harvey Jr. (Cambridge: Cambridge University Press, 2006), 11–12; Schultz, Women’s Religious Activ- ity, 102–109. 17. L. Morpurgo, “Nemus Aricinum,” in Monumenti antichi 13 (1903), 326, gs. 49–52. On the votive dedication of medical tools, see P. Baker, “Roman Med- ical Instruments: Archaeological Interpretations of Their Possible ‘Non- Functional’ Uses,” Social History of Medicine 17, no. 1 (1994): 3–21. 18. Ovid, Metamorphoses 15.479–546; Virgil, Aeneid 7.767–782. 19. On Etruscan sacri cial butchery, see ThesCRA 1:136–182, esp. 181–182. Most of the Etruscan visual representations show the internal organs detached from the context of the body, although a vase found at the site of Cerveteri depicts a goat being stretched out by two men, its stomach facing upward, while a third holds a knife ready to slice into its abdo- men. This example, known as the Ricci vase, is discussed in detail in J-L. Durand, “Bêtes grecques: Propositions pour une topologique des corps à manger,” in La cuisine du sacri ce en pays grec, M. Detienne and J-P. Ver- nant (Paris: Gallimard, 1979), 133–165; see also F.T. Van Straten, Hierà Kalá: Images of Animal Sacri ce in Archaic and Classical Greece (Leiden: Brill, 1995), 117). 20. J.G. Frazer, The Golden Bough: A Study in Magic and Religion, abr. ed. (1922; repr. London: Palgrave Macmillan (1949), 6. The Greek mythological sib- lings Orestes and Iphigenia provide the link between the two cults, with Orestes rescuing Iphigenia from her role as Artemis’s priestess at Tauris (where she was expected to sacri ce humans), and eeing with the cult statue of Artemis to Nemi. For sources, see Green, Roman Religion and the Cult of Diana at Aricia, 201–207. 21. Green, Roman Religion, 185–207. 22. F. Castagnoli, Lavinium II: Le tredici are (Rome: De Luca, 1975). 23. A. Comella, Il materiale votivo tardo di Gravisca (Rome: Bretschneider, 1978). 24. This practice of offering votives directly to the material embodiment of the god has parallels in ancient as well as more recent votive practices. We know, for instance, that at the sanctuary of Asklepios at Athens offerings were placed directly into the hand of the cult statue. S. B. Aleshire, Asklepios at Athens: Epigraphic and Prosopographic Essays on the Athenian Healing Cults (Amsterdam: Geiben, 1991), 41–46. 25. For a discussion of the dynamics of viewing votive dedications in antiquity, see A. Petsalis-Diomidis, “Truly beyond Wonders”: Aelius Aristides and the Cult of Asklepios (Oxford, Oxford University Press, 2010), 271–275. 26. The practice would have had further implications in the context of the healing sanctuary. As Alexia Petsalis-Diomidis has written (in relation to Greek Asklepieia), “one of the effects of displaying old votive offerings would have been the evocation of the sense of a plethora of past miraculous cures in the very space where the viewer stood.” Petsalis-Diomidis, “Truly beyond Wonders,” 272. 27. For examples, see Blagg, Mysteries of Diana, 49 (N1, N2, N3, N4). 29. T. Hackens, “Favisae,” in Etudes étrusco-italiques (Louvain: Publications Universitaires, 1963), 71–99; F. Glinister, “Sacred Rubbish,” in Religion in Archaic and Republican Italy: Evidence and Experience, ed. E. Bispham and C. Smith (Edinburgh: Edinburgh University Press, 2000), 54, 69; Schultz, Women’s Religious Activity, 97. 30. J. Savile Lumley, entry in Journal of the British and American Archaeological Soci- ety of Rome 1, no. 2 (1885–1886): 60–74. 31. For a biography of Savile, see Blagg, Mysteries of Diana, 11–14. Recent work on the reception of classical art in Britain includes D. Kurtz, The Reception of Classical Art in Britain: An Oxford Story of Plaster Casts from the Antique (Oxford: Archaeopress, 2000); V. Coltman, Fabricating the Antique: Neoclassicism in Brit- ain 1760–1800 (Chicago: University of Chicago Press, 2006) and Classical Sculpture and the Culture of Collecting in Britain since 1760 (Oxford: Oxford University Press, 2009); S. Goldhill, Victorian Culture and Classical Antiquity: Art, Opera, Fiction, and the Proclamation of Modernity (Princeton, NJ: Princ- eton University Press, 2011); J. Hughes, “The Myth of Return: Restoration as Reception in Eighteenth-Century Rome,” Classical Receptions Journal 3, no. 1 (2011): 1–28. 32. Pullan, “Notes on Recent Excavations,” 61–62. 33. Personal communication, March 31, 2011. The museum number of the newly identified piece is NCM 1890–1355/257. 34. In 1902, for instance, W.H.D. Rouse, referring to votive body parts from ancient Greece, exclaimed that “this custom shows how low the artistic tastes of the Greeks had already fallen.” Rouse, Greek Votive Offerings, 210–211. 38. D. Freedberg, The Power of Images: Studies in the History and Theory of Response (Chicago: University of Chicago Press, 1989), 157. 39. Wallis, Illustrated Catalogue, 4, 17. 40. Cited in F. Melis and F. R. Serra Ridgway, “‘Mysteries of Diana’: Sulla nuova esposizione dei materiali nemorensi nel Castel Museum of Nottingham,” Quaderni del Centro di Studio per l’Archeologia Etrusco-Italica 8 (1987): 219 n. 9. 41. S. Pearce, “Authority and Anarchy in a Museum Exhibition: Or, The Sacred Wood Revisited,” Cultural Dynamics 7, no. 1 (1995): 128. 42. S. Alberti, “Objects and the Museum,” Isis 96, no. 4 (2005): 565. 43. T. Ingold, “Making Culture and Weaving the World,” in Matter, Materiality and Modern Culture, ed. P.M. Graves-Brown (London: Routledge, 2000), 64.